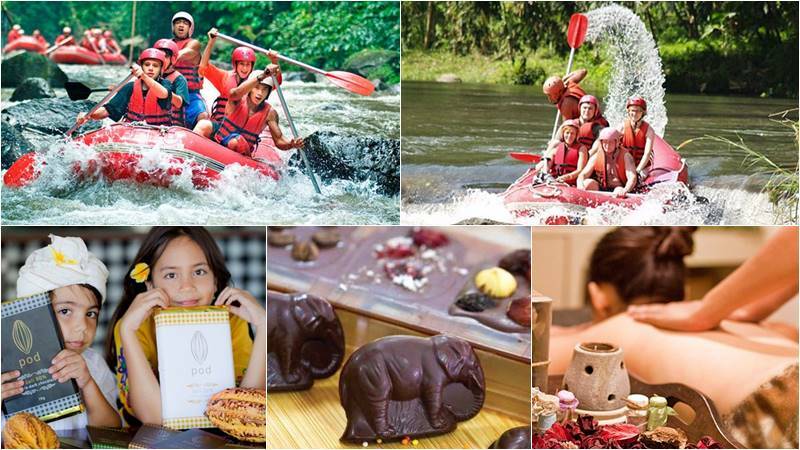 Bali Rafting + pod chocolate + 2 hours spa is an interesting Bali rafting tour package where you will enjoy the Bali river rafting at Ayung River with their natural view and beautiful waterfall and combining with Pod chocolate tour where you able to join on chocolate making process and ended with 2 hours spa package. Limited space and book now only with Bali Rafting Adventure. 14.00 – Join on The Fun Factory Chocolate making. 19.00 – Transfer back to Hotel. Our trained professional guide with internationally accepted equipment will guide you through about 12 km of exciting grades II and III rafting. Your safety is our highest priority always and after 2 hours of fun trip. After your shower and change, the Indonesian Buffet Lunch will be served to you while you enjoy views from the stunning restaurant and relax in a peaceful atmosphere of Bali. After shower and change, Buffet Lunch is served in the restaurant at finish point. Do you Love Chocolate? Looking for a unique Bali vacation experience and a great day out? Come to Pod and learn how to make chocolate as we take you on the cocoa pod’s journey as it gets the ultimate makeover into delicious Pod Chocolate. Our tour starts with the brief from our guide on Choco Tree Plantation, leads through our boutique factory and finishes with you as you make your own chocolate elephants to take home. There are of course plenty of delights along the way–from the raw cocoa fruit, roasted beans and of course our wonderful chocolate from Bali–this is the ultimate chocolate experience for all! We also have a nice cafe to enjoy a delicious lunch and with our awesome homemade ice cream you can cool off. Don’t miss it. Enjoy two hours of spa package with Balinese body massage, foot wash, polishing or body scrub and Aromatic flower bath with ginger tea. Ticket for Pod Chocolate tour.